These silky pj-like pants by Walter Baker are super comfortable while still being stylish- perfect fit for a relaxed spring look. I kept the rest of the outfit structured so it didn’t appear like I rolled out of bed or was in the Hammer Time music video. Last day to enter my Plata Designs giveaway! Your shoes are fabulous! Loving the prints on these pants. Fab look and love your style. The white keeps the pants fresh and classy! You're totally rocking these pants! Great look! I love these pants! 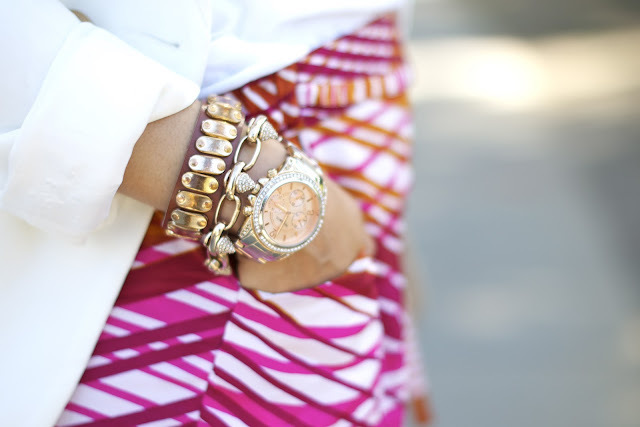 The cuff is such a great idea. Love the whole ensemble.